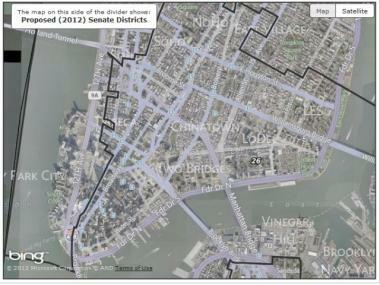 The proposed new Senate maps would reshuffle districts across Manhattan. Center for Urban Research at the CUNY Graduate Center. MANHATTAN — Under a bizarre new state Senate redistricting plan, an Upper East Side pol would represent the Upper West Side, Central Park would land in a Bronx district and Madison Square Garden would be represented from Washington Heights. Much of the attention on Albany's contentious redistricting process has been focused on Brooklyn and Queens, where proposed changes would force longtime incumbents to battle it out in bitter primaries. But it would also slice, dice and reshuffle Manhattan districts into wedges that seemingly make no sense. "I don’t know what criteria they used to draw it," said Baruch College Professor Doug Muzzio, who said some of the proposed districts are so oddly shaped they remind him of mythical creatures. The proposed State Senate district map would divide Lower Manhattan, separating Battery Park and the World Trade Center from the rest of the Financial District. Take state Sen. Liz Krueger, a resident of the East Side who has spent the last decade representing her neighborhood. Under the new proposal, she would find herself representing a large chunk of Hell's Kitchen and the Upper West Side. "I'd have a pretty funky looking district," said Krueger, who added that the existing district borders make sense because they closely follow school zones, community boards and police precincts — along with geographical boundaries. "It's been historically an East Side district." State Sen. Daniel Squadron’s district currently stretches across Lower Manhattan, from Canal Street to Battery Park, and through parts of southern Brooklyn. The redistricting proposal would slice the western edge off of TriBeCa and the Financial District, separating the World Trade Center and Battery Park City from the rest of Lower Manhattan and cutting Battery Park in half. "No one has any idea what they were thinking," said Squadron, who has played a key role in many World Trade Center developments. "Lower Manhattan is a single community. It shouldn’t be split up." The reshuffling is part of a deeply political process that happens every 10 years as legislators try to re-draw state Assembly and Senate lines to reflect population changes reported by the U.S. Census. The stakes are especially high this year, as Republicans try to hold onto a razor-thin majority in the state Senate and carve out a 63rd Senate district upstate. Senate Republicans insist the plan is fair and protects the interests of minority voters, but Democrats, good-government watchdogs and other observers have accused them of turning the process into a partisan power-grab. "It’s not a plan, it’s a scheme," said Sen. Tom Duane of the maps, which were released by the Legislative Task Force on Redistricting and Reapportionment, or LATFOR, late last month. "No matter how you analyze the districts, they’re clearly drawn for Republican advantage," said Duane, a Democrat whose district now takes in Greenwich Village, Chelsea and parts of the Upper West Side. It would be rejiggered to include the World Trade Center, a long stretch of the West Side Highway, most of Midtown and Kips Bay. The district is so oddly shaped that some have likened it to a flying dragon, with its claws extended over Turtle Bay. In another peculiar reshuffling, Sen. Adriano Espaillat's district, now based in Inwood and Washington Heights, would stretch down the West Side Highway and include Madison Square Garden and parts of Penn Station. And Sen. José Serrano's district, which currently covers much of the southwest Bronx, plus some of Yorkville and East Harlem, would be expanded to incorporate a large chunk of the Upper West Side and most of Central Park. "While it would be thrilling to represent Central Park, a place that I love, it really doesn’t make a whole lot of sense for community involvement," Serrano said. The plan would also split several now-intact neighborhoods, including TriBeCa, the East Village, SoHo and Greenwich Village, into multiple districts — a move elected officials and advocates warned would have a serious impact on residents. "It’s a way of watering down those community voices," said Paul Newell, the Democratic District Leader for the 64th Assembly District, who pointed to the intersection of Greenwich and Duane streets in TriBeCa where residents recently succeeded in pressuring the city to install a set of traffic lights after several accidents, including one involving a 3-year-old boy who was hit by a cab. The redistricting plan would divide that intersection into two separate districts. "[Squadron] has one side of the street. He doesn’t have the other side of the street," Newell said. "Who are you going to call [if you need help]?" Many Manhattan Democrats said they are refusing to take the proposed lines seriously, so much so that some said they have yet to have a serious discussion about how their districts might change with staff. Many now believe the first round of maps was nothing more than a political tactic, designed to be so egregious that a second set of maps, already in the works, would seem rational by comparison. "These lines are so abysmal that the Republicans are hoping slightly less abysmal lines will be acceptable," Squadron said. Gov. Andrew Cuomo had originally threatened to veto any lines not drawn by an independent commission, but appeared to be back-tracking in recent days, presumably to secure legislation that would require a fully independent process a decade from now. The courts have also gotten involved, and could at some point decide to order the maps re-drawn from scratch. A spokesman for the Senate Republicans did not respond to a request for comment, but has said previously that LATFOR is now working to improve its maps based on feedback received in numerous public hearings in recent weeks. While there is no firm deadline for lawmakers to finalize the proposed district boundaries, Albany insiders expect to see new maps soon.